Days after losing an intense bidding war to buy Californian-based Virgin America, JetBlue Airways has upped the ante in the battle for high-paying fliers from the Golden State. On April 12, JetBlue announced it will expand its increasingly popular transcontinental service. 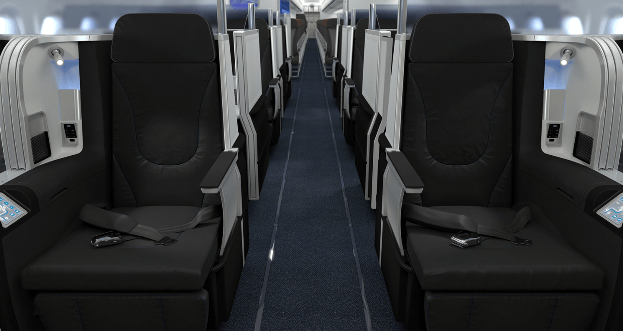 The service, dubbed Mint, is JetBlue’s take on a premium travel experience. Mint service features extra roomy seats, early boarding privileges, free Wi-Fi, specially prepared, tasty meals, and a high-tech entertainment system. JetBlue is bringing Mint flights from Los Angeles and San Francisco to Fort Lauderdale, Fla. Mint flights will also be available as connecting flights from Las Vegas and New York, San Diego with New York and Boston, and Seattle with New York and Boston. “Our plan has long called for strategic growth of Mint on these valuable transcontinental routes, and now is the right time for us to capture this opportunity to bring much-needed competition where customers are facing dwindling choices,” Robin Hayes, JetBlue’s president and chief executive, said in a statement. In early April, JetBlue reported it would bring Mint to the Boston-Los Angeles route in October, as well as beginning seasonal service between New York and San Lucia, New York and St. Maarten and Boston and Aruba this winter. The airline now operates on all of these routes with all-economy-class planes. The nation’s No. 5 airline by traffic, JetBlue debuted Mint flights in mid-2014. The aim was to attract corporate fliers and affluent leisure travelers with high-end service and prices that are lower than those charged by carriers such as American Airlines, Delta, and United Continental Holdings. Larger carriers only offer luxury flights between the New York area and San Francisco and Los Angeles. “Mint’s curated offering and personalized service continues to win over customers who have grown weary of legacy carriers’ tired premium offering,” Marty St. George, JetBlue’s executive vice president of commercial and planning, has said. Mint seats start at $599 one-way, yet they typically sell out weeks in advance thanks to their highly competitive prices and perks. A New York-San Francisco Mint seat departing April 29 and returning May 3 at last check cost $1,706 round trip. American asks $2,529 for the same flight. Delta, meanwhile, charged $3,278 for similar high-end service. Founded in 2000 as a low-fare airline, JetBlue originally offered only coach cabins. Among the airline’s initial appeal, in addition to unrivaled fares, was that it offered free TV at every seat back. About two years ago JetBlue launched Mint on the West Coast. The service performed so well that JetBlue quickly expanded it to Boston, a city where it is the dominant airline. JetBlue then began offering Mint on seasonal flights to Caribbean vacation destinations from New York and Boston. JetBlue has one of the most enviable frequent flyer programs. Features include: no blackout dates on JetBlue operated flights; points can be used for any seat at any time; members earn at least six points per booking when flight are booked on jetblue.com; points can be earned and shared via family pooling; point don’t expire. JetBlue continues to expand and improve its offerings and services, relying on in-house growth and developments, not sky-high priced mergers and acquisitions. In early April, when Alaska confirmed it inked a $2.6 billion deal to acquire Virgin, JetBlue issued a statement saying it performed “a disciplined evaluation” of Virgin’s worth. After the price was bid up, JetBlue said it was “clear our plan for organic growth” offered a better path to create value. JetBlue said its strategy is to bring more competition to the West Coast, expand Mint on coast-to-coast flights, add aircraft to its fleet, and invest in the customer experience. The Alaska-Virgin merger made the new entity the fifth biggest airline in the U.S., directly threatening JetBlue’s place as the nation’s fifth largest carrier by traffic. Alaska said the merger will not disrupt frequent fliers’ status and ability to accumulate and redeem miles. Alaska will keep frequent flier members updated as merger progresses and the two become fully integrated. The burst of recent airline mergers, however, show some disruptions are inevitable. While the co-joined company is now heavily treading on JetBlue’s turf, neither Alaska Airlines nor Virgin America offer flat-bed seating, something JetBlue hopes to cement on its increasingly popular service. The Alaska-Virgin America deal has also sparked controversy. Indeed, the transaction has struck a raw nerve with Virgin’s founder Richard Branson. The billionaire entrepreneur might even fight back by creating a new rival. Branson has suggested he will put up a fight if Alaska decides to absorb Virgin America’s planes and staff and discontinue the storied brand. Alaska has said it has yet to decide whether to keep the Virgin America brand separate. Branson said he is proud of Virgin America and may decide to launch a new domestic airline to preserve the Virgin America name and reputation. “My first desire is that they look after the brand really well, and look after the staff really well, but should that not happen, they know clearly that we will get the brand back and we will come back again,” Branson said in an interview with Conde Nast Traveler.